Recovering from the accidental and devastating death of her husband, Cassie Brighton has returned to the old farmstead left to her by her grandmother. Cassie seeks a respite from mourning but no longer expects it. She’s no sooner settled than she’s swept into a subtle flow of visions of the past that become increasingly stronger as the days pass. Meeting her neighbors distracts her somewhat. There are the old Germans Justin and Berta; young Billy, a genius with music as well as automobiles; his father Guy, a sullen, secretive man obsessively possessive of his son since the day he accidentally caused his wife’s death; and an elusive artist named Hawk whom she’s only seen as a silhouette against the hills or heard as he plays his flute at night. All these people affect Cassie’s life the year she lives in Spring Creek, readying the old house for sale. She’s also on a trail of discovery of her ancestors, courtesy of letters found in a trunk and the words written in German on the back of an antique clock. Cassie’s never been told anything about her family. Now, curiosity whetted, she’s determined to learn all she can before the house and the property leave her hands forever. When she meets Hawk face-to-face, something else springs to life . . . that flame killed when husband Thomas fell to his death. Cassie falls in love again, and from Hawk’s reaction, the feeling is mutual, but old memories and old tragedies may stand in the way of their ever being free to express their attraction. Before the year is out, Cassie will discover more than she wishes to know, about her own background, about Hawk, and about the house where more than one tragedy was played out and has now engrained itself within those ancient walls. 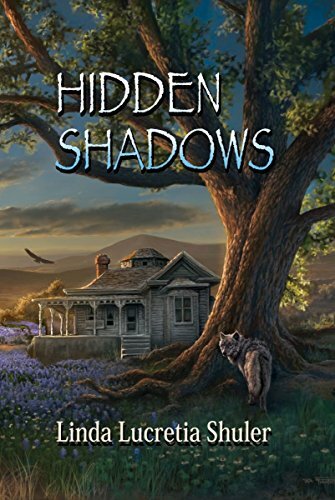 Hidden Shadows is a beautiful first novel, filled with vivid imagery bringing the Texas plains to life for the reader, as well as a delicate love story. Newcomer Linda Lucretia Shuler has written an entertaining and thought-worthy romance, showing as it does that even events in the past that are well hidden can often affect both occurrences and people in the present.